Embrace limitations and boundaries as a source of inspiration. 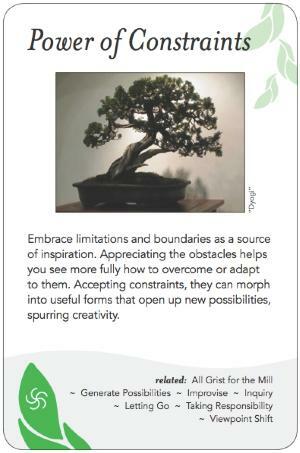 Appreciating the obstacles helps you see more fully how to overcome or adapt to them. Accepting constraints, they can morph into useful forms that open up new possibilities, spurring creativity. The Power of Constraints is like writing haiku; the limitations on the form generate creativity. Appreciating the limitations posed by gravity enabled the Wright brothers to study and invent the airplane, using lift to overcome gravity's constraints. We need to appreciate how we are oriented towards limitations or constraints, and that any container makes possible that which is contained. Constraints limit breadth and can increase depth, if you're willing to let that happen. They invite us to explore new and different angles, opportunities, and gifts -- to see new possibilities. There is a wonderful both/and here, of both knowing what the givens and constraints are, or are likely to be, and seeing the constraints as gifts, as opportunities for learning, for creativity, for responding to what is. Rather than accepting with enthusiasm the constraint of, for instance, a poorly ventilated meeting room, perhaps the greater wisdom is to ask why we are meeting here.
? ?May need more? Fifth Discipline Fieldbook?